Hi guys! I hope you had a great weekend and start to the week! My husband and I took a quick drive to the mountains on Sunday afternoon. I needed to pick up some postcards for the latest round of Reddit Gift exchanges, and we wanted to see some of the fall foliage. He had a blast driving my car (as I kept telling him to slow down)! Then the past two nights we watched the Cubs beat the Cardinals (GO CUBS GO!). Pretty awesome start to the week! In August, four indie makers (Digital Nails, Indigo Bananas, Literary Lacquer, and Octopus Party Nail Lacquer) teamed up for the Crème à la Mode box, a new collaboration centered around creams. Creams can be a rarity with indie makers, and I'm not entirely sure why. I love a good cream polish! As soon as I heard about the quarterly box, I knew I'd be purchasing it. 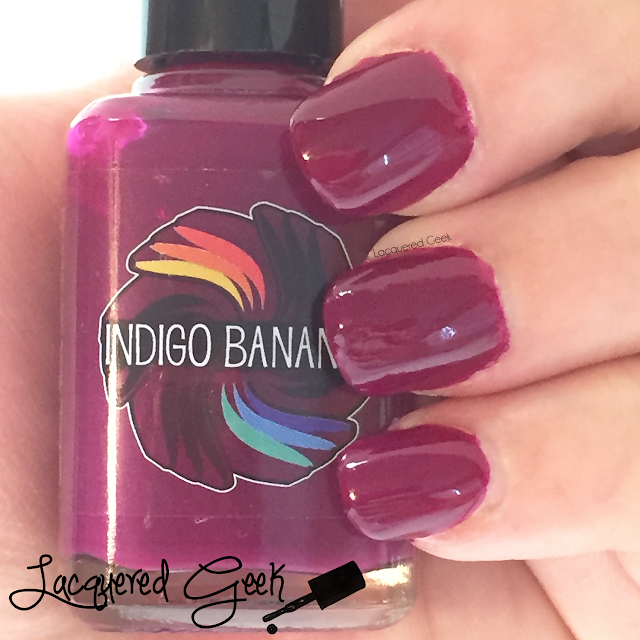 Today, I want to share the polish from Indigo Bananas. Hi guys! Last night was the season premier of Supernatural! I'm still catching up. I've got seven episodes of season nine to finish, and then season ten, but I'm still super excited! I just can't believe I waited so long to watch it! I was always scared it would be too scary for me (I'm a big ol' chicken), but other than the first season, it's not been too bad. 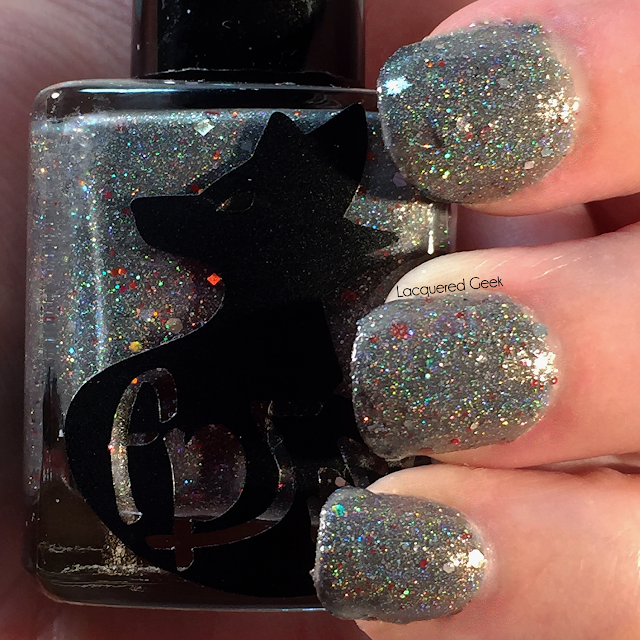 In celebration of last night's premier, I want to share a polish from Frenzy Polish's TV Frenzy collection - Winchester! Hi guys! I hope you had a great weekend! It didn't rain the entire weekend here!! It did rain insanely hard for most of Saturday, but the sandbag in front of the garage worked like a charm! Sunday was cloudy and it drizzled a lot, but it wasn't a bad day. I'll share a little more about my weekend at the end of the post, but for now... let's get to the polish! During the July 4th sale, I picked up quite a few Azature polishes for my birthday, and one of them was Opal Diamond. All of the swatches that I could find online showed it as a pretty pinkish light gray polish, and I knew it would be something unique for my collection. I'm not sure if the formula changed or what, but when I got the polishes, I noticed that my Opal Diamond didn't look anything like the bottles that I saw online. Happy Friday! I'm so glad it's the weekend. I've been waiting for this day since... oh, say Monday! I don't even care that the weekend is going to be a complete washout due to Hurricane Joaquin. I'm just praying that my garage doesn't flood too much. My husband moved some sandbags out in front of it. When he went out and checked it this morning after a night of rain, he came in saying "There's not as much as I was expecting".... so fingers crossed! 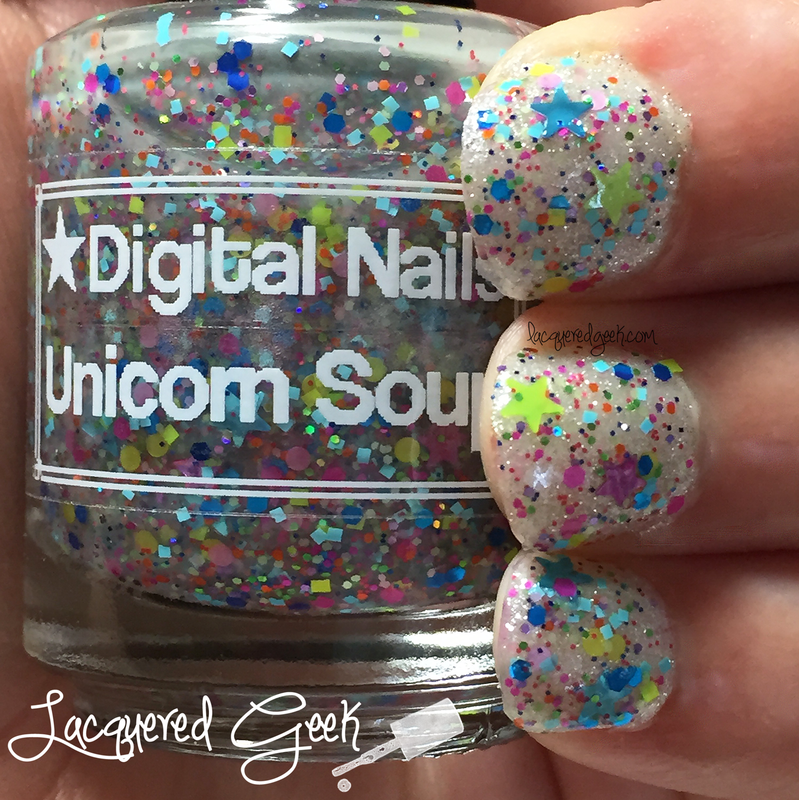 Today, I've got the second polish from the Unicorn Cahoots collaboration between Ellagee and Digital Nails. Yesterday, I shared "Sir Twinkle Toes" from Ellagee, and now it's time to share "Unicorn Soup" from Digital Nails. Hi guys! A few months ago, two of my favorite indie makers, Ellagee and Digital Nails, released a collaboration box. Their collab boxes never disappoint, and this was one was no different. The theme was unicorns, so it was a complete must-buy for me. Today, I'm going to share the polish from Ellagee with you. Happy New Doctor Who Day!! It's the best day of the year! I've been eagerly awaiting the new season since Christmas! And it's finally here!!!! In celebration of this wonderful day, I'm going to share some of my favorite Doctor Who themed polishes! 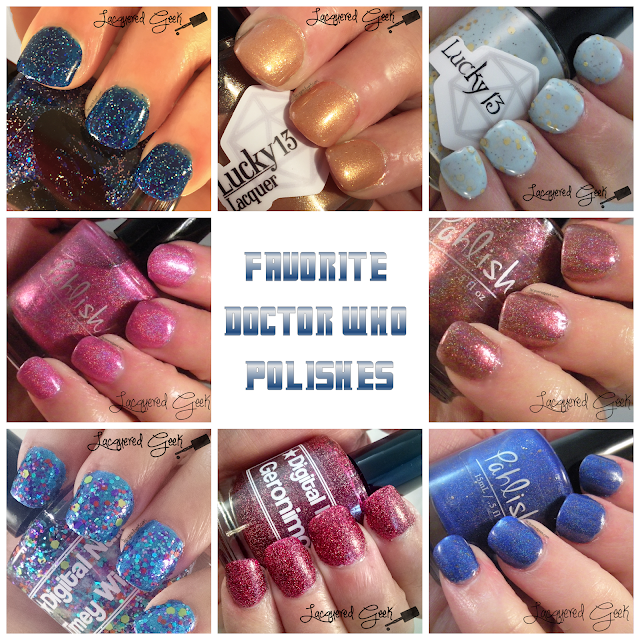 Doctor Who inspired polishes are what got me into indies when I first got into polish! Yay! It's Friday!! I'm soooooo glad! This week has been so long with both me and my husband sick with whatever this crap is that's going around. We're on our 2nd big box of Mucinex with no end in sight! At least I can take it fairly easy this weekend. My only plans are watching the season premier of DOCTOR WHO on Saturday!!!!! I cannot wait!!!!!!! 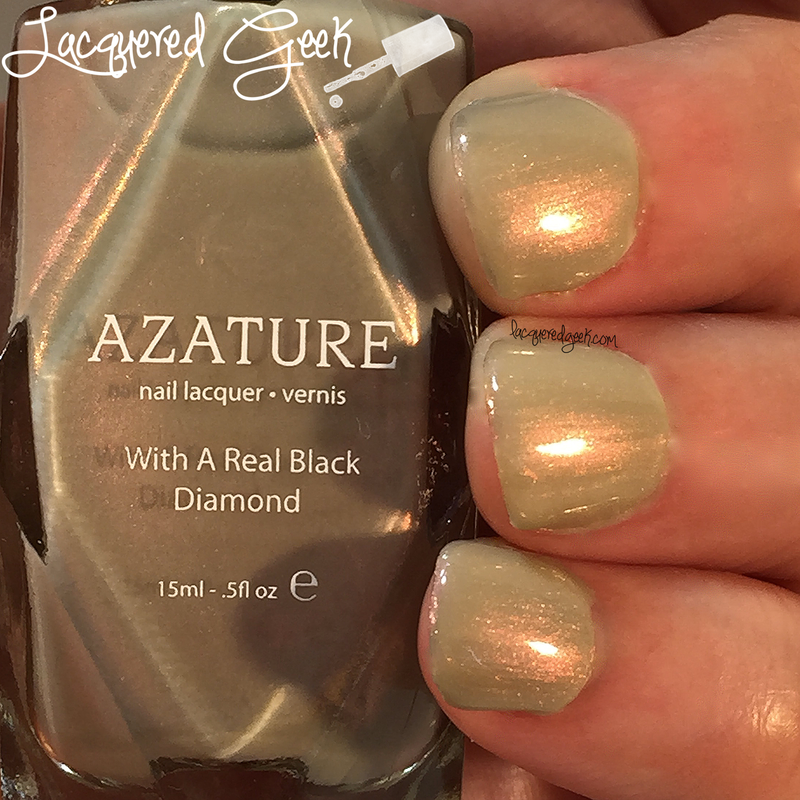 Today, I want to share a polish from Azature with you. I'm sure you've heard of Azature, the maker of one of the most expensive nail polishes created. 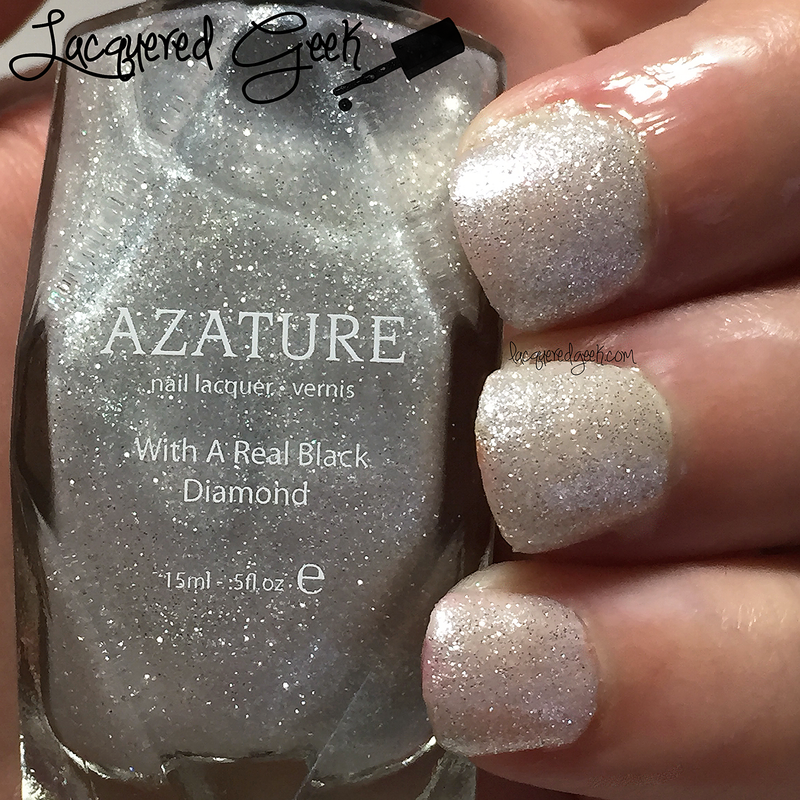 Since not everyone can be millionaires, Azature also created a line of polishes that can make you feel like you are. I'd previously picked up a bottle of Azature Black from a blog sales, and have been lusting over the swatches of several others. Over the 4th of July weekend, Azature had an amazing sale, and I simply could not pass it up. I called it an early birthday part to myself. One of the polishes that I picked up was Azature White.